I took your seminar a few years ago on electronic filling and it has helped immensely. I’ve even moved to a different seminary, and it is still an effective system. In a summer course the other day, a fellow student bemoaned not being able to find a document. He asked if I ever had that problem and I had to say no. That little e-mail reminded me that there’s one tip I don’t think I’ve ever shared on my blog before. It’s pretty simple: name every file you save with last name, first name, title. My esteemed friend Dr. Eric Newton recently sent me his dissertation, so it’s named NewtonEricSoundWordsRecognizingPaul’sLettersToTimothyAndTitusAsTheStandardForDoctrineInAPostconservativeEra.pdf. Often I use a descriptive title instead of the actual one to keep it shorter: MinnickMarkPrayerIsAsking.rtf. Notice that I capitalize every word, no matter what, and use no spaces so that I can see more of the file name before it is cut off and so I can find things faster while typing searches. I can find either of those files in one instant by simply hitting my Windows key (or F1 on my Mac, which I’ve mapped to open Spotlight) and then typing “NewtonEric” or “MinnickMark.” Instantly, all of the articles or books or presentations I have saved from those authors are listed for me. It almost never takes me any time to find a file, and both Mac OS X and Windows 7 index not only the titles but the contents of these files (except PDFs in Win 7—frustrating but fixable). But I go just one or two steps further. I have a set a folder called “Full Books” for complete electronic books and a set of topic folders called “Articles of Value” for everything else I want to save. 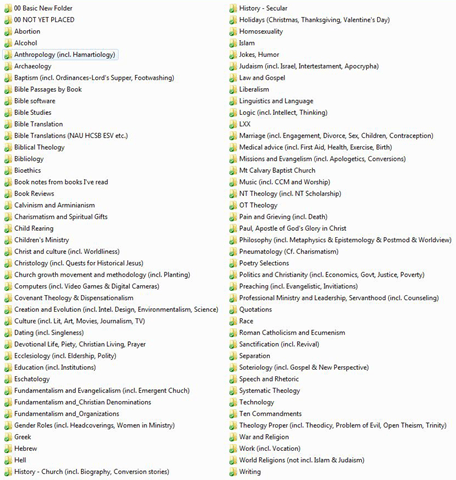 Those Articles of Value are divided into topics, from Biblical Theology and Baptism to Writing and World Religions (a picture of all my topic folders is below). Each folder begins with two files and gains more over time. Those two initial files are special files: A bibliography file (00 Bibliography.rtf to keep it at the top of my list) and an illustrations file (01 Illustrations.rtf to keep it in second place on my list). If I find an illustration that fits the topic of Preaching, I’ll copy it and paste it into the 01 Illustrations.rtf file inside that folder. I probably save a few articles a week, sometimes more and often less. But when I or someone I know wants to research a given topic, I’ve got a collection of good stuff I would have lost otherwise. One other special folder inside my topic collection is called “Bible passages by book.” If I get an article—or even write my own document—about a particular passage, say Romans 2, I stick it in the “Rom” folder. Exegesis I did years ago is still available and helpful to me. For verse-level illustrations or exegesis I stick with BibleWorks, but anything broader goes in my topic folders. Such a system will take an initial time investment, but it is truly easy to maintain and will reward you if you are a preacher, teacher, or scholar. Mark, I am wondering why you bother making separate folders by topic. Why not just put key words in the file name? I used to do the same, but found that I might start two similar folders with similar names (forgetting I had started one already). Now with Google Desktop search and windows searching capabilities, I can search my illustrations folders pretty quickly. And key words in the file name helps with the searching as well. Good idea! Do what works for you, I say! I could see how that would be valuable. If I had started my system with Zotero instead of before it existed, I might use a tagging idea similar to yours. I’m invested in a particular system, however, and every time I think about changing I balk at the time investment. I can understand the ‘invested in the system’ bit. I still have a wack of files under my old folder method. I had this idea that I would put them into an Access database as OLE objects at one point, but it got to be too much work. Then I started the folder thing. But as search engines improved, I thought, who needs it? So everything new gets dumped into one folder, with key words in the file name. But I still have all the other folders too… it’s a good thing I can search them all with Google Desktop.